This reminiscence, published in two parts, details the experiences of Orinda S. Baker and her family, who moved to Centralia, Nemaha County, in 1860. The Bakers, like other Kansas families, suffered from hunger and sickness during the severe drought that struck Kansas that same year. Included at the end of Part I there are two letters regarding the drought and the aid received from the East. 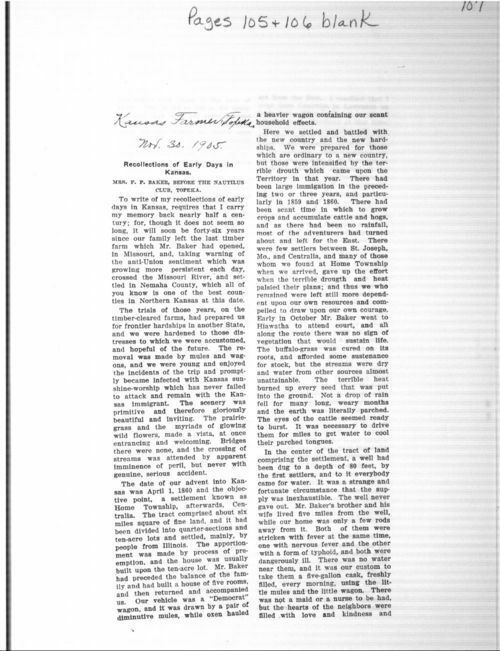 Part II begins with a letter from Phil C. Day regarding relief goods sent to Kansas; Baker had written to out-of-state friends about the suffering of Kansans and acted as coordinator of relief supplies. In January 1862 Baker and her family moved to Topeka when her husband, Floyd P. Baker, was elected to the State House of Representatives. The rest of her reminiscence relates her experiences while living in Topeka, with the exception of a selection discussing a particularly fierce snow storm that hit on January 18, 1861. This source could be used to encourage discussion about several challenges that settlers faced, including drought, famine, and severe winter storms. Baker's reminiscence could work in tandem with letters and pamphlets requesting aid during the drought (such as Thaddeus Hyatt's letter to President Buchanan), or it could be grouped with other reminiscences compiled by newspapers (such as that of Martha Valentine).